(RRP £199.99). 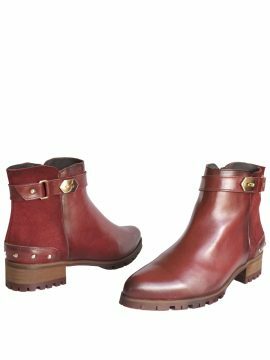 Classy and chic – these real leather chunky heel ankle boots by Vitti Love are in a gorgeous rich deep red that makes them irresistible. Made in Spain, they are made in fine quality materials to the highest standards. Ideal for smart or smart-casual wear. They feature a sturdy silver-coloured metal zip on each side of the boot, set within a suede leather panel. and a black chunky heel and sole. The black lining and insole are 100% leather. The insole is also cushioned for added comfort. (RRP £199.99). Classy and chic – these real leather chunky high heel ankle boots are in a gorgeous rich deep red that makes them irresistible. Ideal for smart or smart-casual wear with anything you like – a skirt, leggings, jeans or trousers. 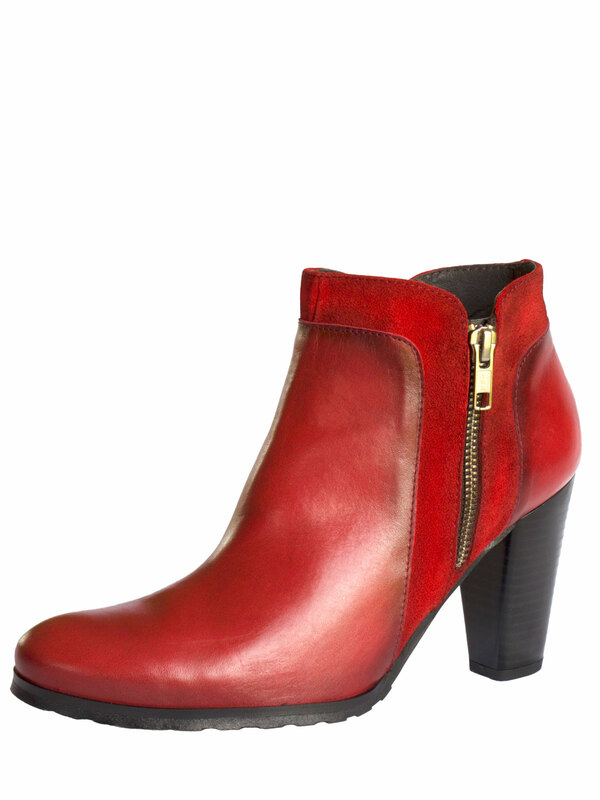 Made in Spain by Vitti Love, these ankle boots are high quality and very well-constructed. Sizes: Because the boots are made in Spain, they come in Eur sizes but we have also given the equivalent UK sizes, according to standard sizing charts. (RRP £199.99). 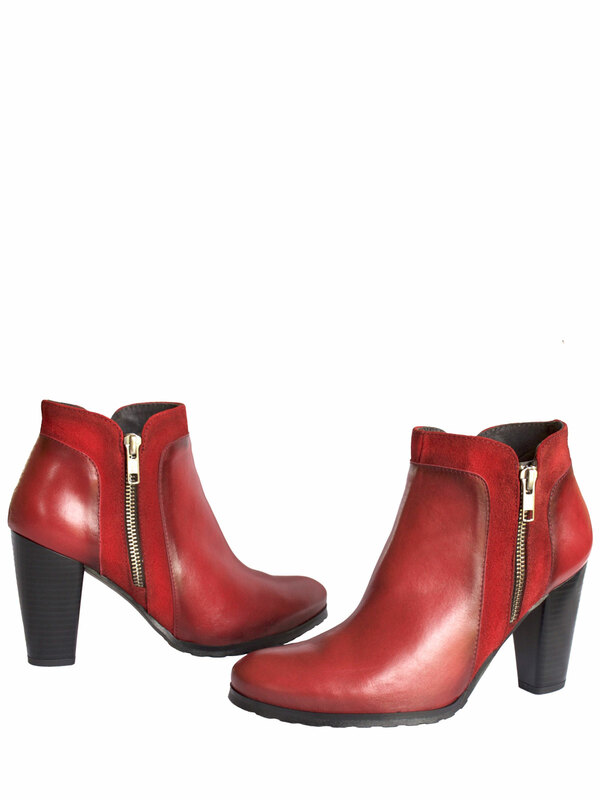 These flat heel leather ankle boots are absolutely fabulous, very stylish and top quality. Great with trousers or jeans for smart-casual wear. 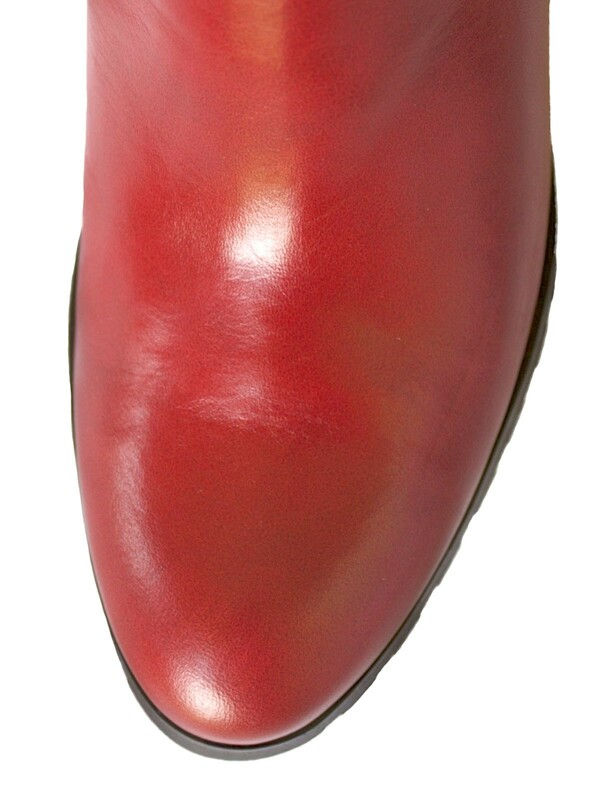 They are in a very attractive dark 'russett red' real leather and suede. Made in Spain by Vitti Love, they are well-constructed to the highest standards. The front of the upper is smooth leather with a suede panel around the back. The boots have a subtle pointed toe and feature a leather strap around the top of the boot with a gold-coloured buckle detail and 6 gold studs on a leather strip around the back. The flat/low heel and sole are cleated to provide a good grip. The lining and insole are 100% leather and the insole is also cushioned for added comfort. Please read our Product Information below for full details and important sizing information. (RRP £199.99). Smart, chic and neat. These real leather brogue style flat shoes are just beautiful quality and so comfortable to wear and walk in. 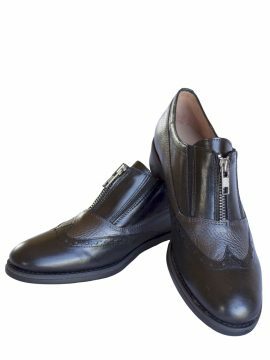 Made by Vitti Love in Spain to the highest standards, the upper is two-tone - in black smooth leather and dark grey textured leather. There is an antique silver metal zip fastening at the front, with two narrow V-shaped elasticated strips either side for greater ease of fit. The insole and lining are also in leather, and the insole is cushioned for extra comfort. Please read our Product Information below for full details and important sizing information.